The 2012 edition of Turning Point is now in the record books. Who is the new number one contender (and who won’t get a title shot for another year)? 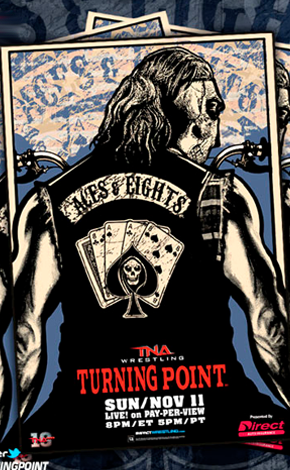 Did Joseph Park and Kurt Angle each successfully overcome the Aces and 8’s? Did Eric Young show up to tag team with his wife? And, most importantly, was Jeff Hardy successful in retaining the World Title? Click “read more” for full results of the show plus any notes about the match/post-match that are pertinent to know. Credit for these results goes to Jason Powell who covered the event in full over at ProWrestling.net so go there for a more detailed analysis.